I’m no cupcake queen. But, I sure love trying to come up with creative ideas for this sweet little treats. Although I one of the world’s worst cooks (seriously), I’ll bake for my son once in a while. So, I figured – why not use that blank top of frosting as a canvas for icing art? I’ve made Monet’s Impressionist cupcakes and Jackson Pollock ones. This time I got to thinking about color mixing. Over a decade ago I had my first day on the job as a museum-based children’s art teacher. My then-boss asked me to get paint trays ready for the kiddos to work with. I went to the super-stocked paint closet and got out a rainbow of temperas. My boss ran in and stopped me before I started pouring the paints. “Only the primaries. And white,” she said. From then on I only gave the kids red, yellow and blue (and white to lighten the hues) for any project that we did. A landscape? Primaries please. A self-portrait? Yep, only red, yellow and blue. The objective was or the children to think about the colors that they were using and make their own. With that in mind, I’ve done a zillion (maybe less) color mixing art activities. This time I wanted to try something different than the good old paint and brush color mixing. There are tons of variations on this activity, but this one adds a sweet treat that the kids can eat to the mix. Before you start the baking (especially if your child is new to color mixing), discuss the process. Give her new vocabulary words, including primary colors (red, yellow and blue) and secondary colors (orange, green and purple). You may also want to read a book that focuses on this concept. My favorite for preschoolers (or around that age) is Leo Lionni’s “Little Blue and Little Yellow” . I’ve also had success with Ellen Stoll Walsh’s “Mouse Paint”. · White cake mix- Like I said, I’m not a baker. I use the boxed stuff and don’t feel one bit bad about myself for my lack of skills. But, if you’re a dessert diva please do substitute your own homemade recipe. If you have a really great one that you’d like to share, please leave a link to it in the comments section. You’ll also need whatever ingredients your mix requires (i.e., eggs, water, oil), a bowl and mixer. · White frosting- Again, mine comes from a package. 1. Mix up the cake. This is an opportunity for your child to explore math and science! Let her measure and mix the ingredients. 2. Spoon the batter into three bowls. 3. Have your child squeeze two or three drops of food coloring into the bowls and mix them. Add blue and yellow into the first bowl to make green. Add red and yellow to the next bowl to make orange. Add red and blue to the last bowl to make purple. 4. Spoon the colorful batter into the lined tins. Make solid-colored cupcakes or combine them. 5. Bake the cakes. Do not let your child do this step. Never allow your young child to use or go near the stove and oven. 6. Clean the bowls and spoons thoroughly. 7. Divide the frosting among the three bowls. 8. 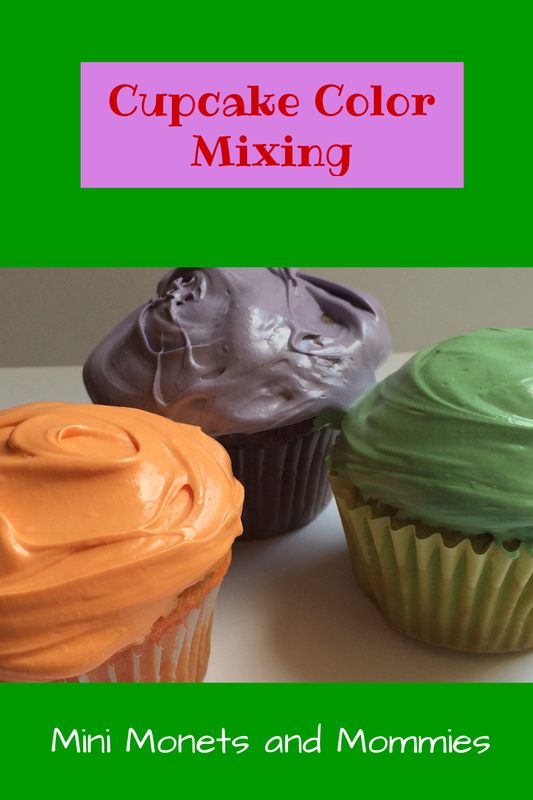 Add food coloring to the frosting and mix. If your little one is wondering why the frosting colors are so light, ask her to think about what it started as. When you mix white with another color it lightens it – making the frosting pastel. Do you have a favorite cupcake recipe? Add a link to the comments section below. Do you want more ideas for creative treats? Visit and follow my Pinterest board! Follow Mini Monets and Mommies's board Cupcakes! Yum! on Pinterest. I like your shots of the colors as they were mixing...reminds me of the Impressionists - I think I might have done a few cupcakes with the half blended frosting too. Very fun way to explore colors!